The Finder sidebar has undergone quite a few changes since OS X Snow Leopard. While we hope that the Finder sidebar will receive some badly needed refinements in the near future, there is no reason to wait to gain back some of the productive tools that were lost with the release of OS X Lion and subsequent versions of OS X. Lion's sidebar eliminates the entire Search For group. This was a handy area in the sidebar that let you quickly find documents and applications you worked on or used today, yesterday, or during the past week. It also listed all of the images, movies, and documents stored on your Mac. Apple attempted to replace the sidebar's Search For a section with a single entry in the Favorites section called All My Files. All My Files displays images, PDFs, music, movies, documents, and more, all in a single Finder view that is split up into the various categories. Apple wants us to use the All My Files entry so much that it made All My Files the default view when you open a new Finder window. Changing the default view seems to be one of the first changes most Mac users are making to the Finder because they prefer the Finder to open on their desktop, home directory, or documents folder. While you can't restore the old Search For sidebar section, you can get back the same functionality through the use of Smart Folders, which can be saved to the Finder's sidebar. We're going to use the Finder's ability to create Smart Folders, which let you organize files by what they have in common, instead of where they are located in the file system. Smart Folders use Spotlight to compile a list of items based on the search criteria you set up. Smart Folders don't contain the actual files or folders; instead, they hold links that point to the location where the items are stored. For the end user, clicking an item in a Smart Folder has the same effect as clicking the item in its actual storage location. The only real difference is that while an item in the Finder's file system can only be located in a single place, an item can be shown in multiple Smart Folders. 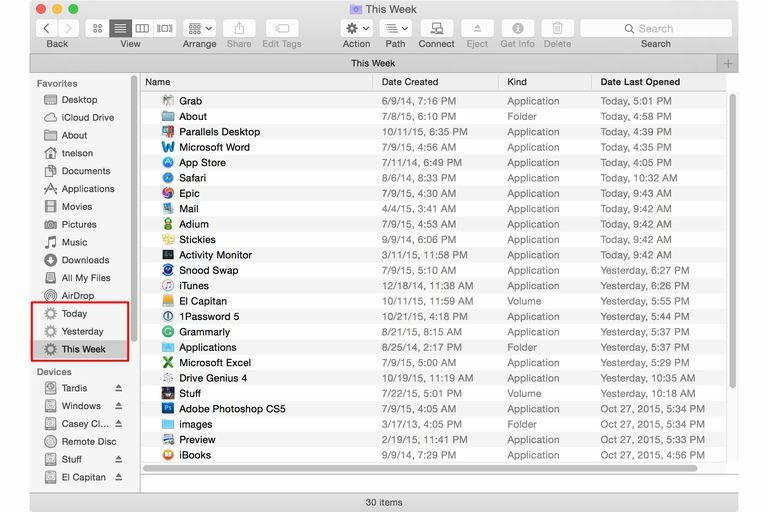 Make sure the Finder is the frontmost application, either by opening a Finder window or by clicking on your Mac's Desktop. We will recreate the Today Smart Search from the pre-Lion Finder sidebar as an example. A Finder window will open, with the search pane open. Select the area to search; for this example, click the This Mac item. On the far right side of the search pane, click the plus (+) button. The Search Criteria area will display, showing various buttons and fields, depending on the search criteria you chose. Click the first search criteria button and select 'Last opened date' from the drop-down menu. Click the second search criteria button and select 'Today' from the drop-down menu. Hold down the Option button and click the '…' button to the far right of the search criteria you just set up. Two new search criteria rows will display. In the first new row, set the single button to 'None'. Set the search order to Last Opened by clicking on the Last Opened column in the search results (you may need to scroll to see the column). Click the Save button on the far right of the search pane. Give the Smart Folder a name, such as Today. You can leave the 'Where' setting at the default location. Place a checkmark next to the Add to Sidebar box. The Today item will be added to the Favorites section of the Finder Sidebar. The six Search For items in the pre-Lion sidebar were Today, Yesterday, Past Week, All Images, All Movies, and All Documents. We have already created the 'Today' item for the sidebar. To recreate the remaining five items, use the instructions above, along with the following search criteria. The remaining three items only need the first two rows of the search criteria. You can delete the unneeded rows by clicking the minus (-) button to the far right of each row.